The Psaltery is a musical instrument for anyone to play! It is a handmade, musical instrument is designed for making music played by a simple color code system. This color coding allows for non-musically inclined individuals to learn to play a musical instrument in less than 15 minutes! The Psaltery has strings that are color coded, representing a different chord for each color. Red strings are notes in the C chord. Blue strings are notes in the F chord. Green strings are notes in the G chord. When the words in a song have the C or red color you would play any two or more red strings while singing the song until the next color is to be played. You play any two or more strings of the same color while singing that section until it changes color/chord. 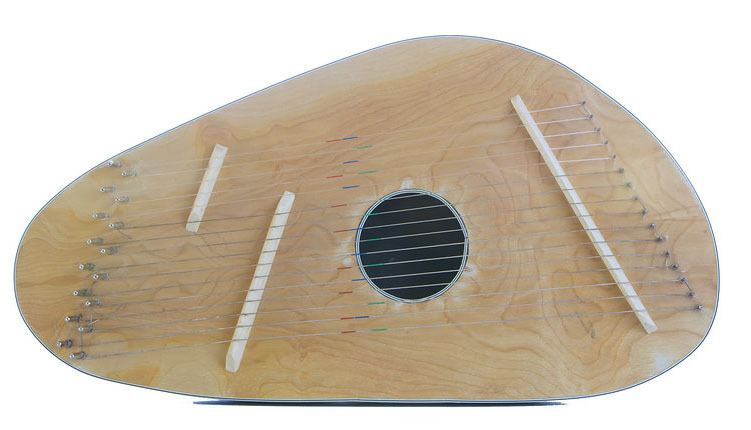 The instrument also can be purchased as a “Strummer Psaltery” to have the color-coded strings aligned for strumming versus plucking patterns. It is possible to alternate between patterns and mix them in such a way to break up the sound to help match the rhythm of the song. The colored marks on the strings represent notes in a particular chord. Various rhythm patterns could be played with the colored strings in the sections of the song (simple is best). Practice will allow for greater flexibility and more control for smoothly moving from higher to lower strings in a song. The goal is to play the right color/chords at the same time one is singing the words of that section. Chords are formed by playing rhythm patterns on the strings of the same color. Research has shown the value of health that is improved through the use of personal music making. The “sounds of healing” and the “ultra sounds” of penetrating music made personally have more effect on the body than you realize. Vibrations from a stringed instrument combined with the simple but powerful tones of the human voice create a healthy physical and emotional response. The underlined notes are “red”, making the notes of a C chord (CEG). The notes in Bold are “blue” and are the F chord (FAC). The notes Italicized are “green” and are the G chord (GBD). The lowest string is G and is out of order, but is intended to add an extra base string sound.